Root canal therapy is done to repair or save a tooth that has an infection or is badly decayed. We can do this procedure in one visit, eradicating the source of the decay while saving your tooth. Our experienced doctors will make sure you are comfortable during this procedure, which is accomplished with a minimum amount of pain, comparable to getting a filling. Every tooth has a root with one or more root canals leading off the root. 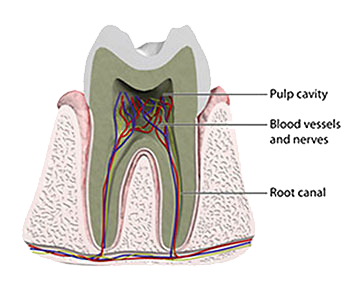 The canals contain pulp material consisting of blood vessels and nerve tissue, which help nourish the tooth. When this pulp gets infected due to bacteria from decay or trauma, it must be removed and the canal thoroughly cleaned and disinfected. Root canal therapy effectively saves a tooth, even though the root of the tooth is now dead. The tooth is still holding fast in the jaw bone and is still being nourished by surrounding tissues. This is important for chewing and biting purposes as well as maintaining jaw structure. Using digital X-rays, we can determine the extent of the infection and any damage to bone tissue. We can also take panoramic images if necessary to get a more comprehensive image of your jaw and teeth. When there is infection in the pulp tissue, we clean it out gently using a rotary instrument. This effectively removes the infected material so it can’t spread to any other tissues or teeth. Once that’s done, we carefully disinfect the area and then fill the inside of the canal with a rubber-like material. Lastly, the canal is sealed to protect the tooth from any other bacteria. In order to gain access to the root canal, an opening needs to be made in the tooth. After sealing the canal, we often need to place a crown over the tooth to protect the opening. Our high-quality crowns look like your natural teeth and provide the strength and support needed to maintain the tooth’s functionality.